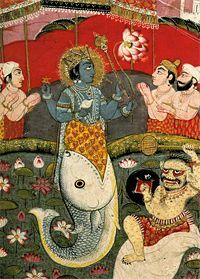 Incarnation of Vishnu as a Fish, from a devotional text. In the Hindu religion, Matsya (Sanskrit: meaning "fish") is the first avatar of Vishnu, the preserver god in the Hindu Trimurti (trinity). According to Hindu mythology, Vishnu appeared in the form of a fish during the epoche known as the Satya Yuga to save the totality of living beings (including humans) from a great flood. This story is notable for its striking similarity to the biblical story of Noah's ark. Both stories describe the construction of a large vessel by which all species of life upon the earth are saved from a cataclysmic flood, which suggests that they may share a common origin. Hinduism teaches that whenever humanity is threatened by extreme social disorder and wickedness, God will descend into the world as an avatar to restore righteousness, establish cosmic order, and redeem humanity from danger. The avatar doctrine presents a view of divinity that is compatible with evolutionary thinking since it suggests a gradual progression of avatars from amphipian through mammal to later human and godly forms. Most importantly, the concept of avatar presents the theological view of a deeply personal and loving God who cares about the fate of humanity rather than ignores it. Time and time again, the various avatars are willing to intervene on humanity's behalf to protect its overall cosmic wellbeing (loka-samgraha). The avatar doctrine is a seminal concept in certain forms of Hinduism, particularly Vaishnavism, the sect that worships Vishnu as the Supreme God. The word Avatar in Sanskrit literally means "descent" of the divine into the realm of material existence. Through the power of maya ("illusion" or "magic"), it is said that God can manipulate forms in the physical realm, and is therefore able to assume bodily forms and become immanent in the empirical world. Hinduism states that the Absolute can take on innumerable forms and, therefore, the number of avatars is theoretically limitless; however, in practice, the term is most ubiquitously related to Lord Vishnu, of whom Narasimha is an incarnation. Hinduism recognizes ten major avatars, collectively known as the "Dasavatara" ("dasa" in Sanskrit means ten). Scriptural lists of these ten divine manifestations frequently differ, however, the most commonly accepted begins with 1) Matsya, who is followed by 2) Kurma, a turtle; 3) Varaha, a boar; 4) Narasimha, a man-lion hybrid; 5) Vamana, a dwarf; 6) Parasurama, Rama with an axe; 7) Rama, a noble man; 8) Krishna, the teacher of the Bhagavadgita; 9) Buddha, a spiritually enlightened being, and, finally, 10) Kalkin, the last avatar who has yet to arrive. These avatars usually take a physical manifestation for the purpose of protecting or restoring dharma, the cosmic principle of order, when it has devolved. Krishna explains this in the Bhagavadgita: "Whenever there is a decline of righteousness and rise of unrighteousness O Arjuna, I send forth Myself." (Shloka 4.7) Vishnu's tenure on earth typically involves the performance of a particular series of events in order to instruct others concerning the path of bhakti (devotion) and ultimately leading them to moksha (liberation). The central myth of Matsya revolves around Manu Satyavrata, the man who would eventually go on to become the progenitor of the human species according to Hindu mythology. It is said that Manu Satyavrata spent 10,000 years of his life practicing spiritual austerities. One day as he was offering an oblation of water to a river, a tiny fish lept up into his hands. As he was about to throw the fish back into the water, the fish asked him for protection from the bigger fishes in the river that were constantly chasing it. In order to protect the fish, Manu Satyavrata placed it in an earthen jar. However, the fish soon outgrew the jar and so Manu returned him to the river. The fish continued to grow and soon outgrew the local river. Manu Satyavrata then placed the fish in the wide Ganges, the largest river in India, but the fish outgrew this river too, and so Manu Satyavrata then placed him in the ocean. At this point, Manu had come to the conclusion that the fish had some kind of divine properties, and soon enough Manu's suspicions were confirmed when the fish revealed itself to be an avatar of Vishnu. The fish then proceeded to tell Manu that the world was going to end soon after a deluge, and it advised him to build a large boat, upon which he should place the most important elements of the world, including the seven Rishis, seeds of various kinds of plants, and one of each type of animal. When the deluge started, the fish promised that he would rescue the boat. Manu followed his command, and once the deluge occured, the fish remained true to his word, delivering the boat to safety. Manu fastened the boat to the horns of the fish with Vasuki, the divine snake. The fish then carried the boat through the floodwaters, until they reached the peaks of the Himalayas. Once the rains had stopped and the water had receded, Manu sailed to the plains and began procreation for the next epoche, the Krita Yuga. Matsya is also said to have first delivered the Vedas, the fundamental texts of Hinduism, to the human race, giving them to Manu Satyavrata. The principles of this book were to govern the human race for the remainder of the four Yugas. As described in the Bhagavata Purana, Matsya first stole the Vedas from the demon Hayagriva, who had previously stolen the books from the sleeping Brahma, the creator god of the Hindu trinity. Some earlier texts claim that Matsya is actually an incarnation of Brahma and not Vishnu. In Hindu iconography, Matsya is typically depicted as an ordinary fish, or else as a half-fish, half-man. In the latter representation, his lower half is that of a fish while the upper portion is that of a man. These partially anthropomorphic forms bear a very close resemblance to traditional depictions of Vishnu. The upper torso has four hands, two of which carry the Shankha, (a conch-shell) and the Chakra (a discus), while the other two are held in the Varada and Abhaya poses, signs of charity and fearlessness, respectively. Matsya may also carry a variety of other weapons and symbols which are typical of Vishnu. Matsya is often depicted with two or three eyes, or from a side profile with only one eye visible as is typical of a fish. Matsya is commonly white in color. Sometimes his jaws are held agape in order to illustrate his ferocity. When accompanied by another figure, Matsya is shown with some permutation of Sri, Bhu and Nila, or simply with Sri alone. Although he is not widely worshipped in comparison to later avatars such as Rama and Krishna, Matsya is still of great significance to the Vaishnava tradition. The development of the various avatars has often been linked with the modern scientific theory of evolution and, as in this theory, Matsya represents the idea that life as it is known today originated out of water. In his relation to these primordial waters, Matsya is closely linked with creation. Matsya represents the first incarnation to set in motion the next epoche of society and the cosmos when he assists Manu Satyavrata in repopulating the earth before the beginning of the Krita Yuga. This role would be shared by a number of avatars who followed. In this association, he extends the conception of Vishnu's power beyond the role of preserving dharma, but also into the realm of creation. The central myth describing the process by which Matsya saved and re-created the world is notable for its striking similarity to the famous Biblical story of Noah's ark. Both stories describe the construction of a large vessel by which all species of life upon the earth are saved from a cataclysmic flood, which suggests that they may share a common origin. ↑ Note: some Hindu sources replace the Buddha with Balarama. Gupta, Shakti. Vishnu and His Incarnations. Delhi: Somaiya Publications Pvt. Ltd., 1974. This page was last modified on 18 July 2008, at 17:40.